This story tells the coming of age of an overprotected young mother who becomes an adult. One beautiful woman without a plan; three men, each with a plan. Shelby is a spectacular beauty whose husband, a Hollywood stuntman, runs off with a rich glamorous older woman. On her own, Shelby is raising 8-year old Pamela and goes to work to make ends meet. She is naïve, unaware of her luminous beauty and easy-going charms neither of which goes unnoticed by men, even a world famous novelist who sets his eyes on her. She meets an irresistibly handsome and successful attorney who instantly takes up residence under her skin. Men like these are new to her, exciting and fascinating. Shelby’s topsy-turvy world is grounded by motherhood and her caring friend, Thelma. Into this curious limbo where all that is required of Shelby is not to do anything she would regret, enters Marc, a successful screenwriter and former family friend who, with his final divorce decree in hand, comes calling. Because of Shelby, the lives of the three men intersect and interact in sometimes surprising, sometimes lasting and always memorable ways. ​Where is the love? Who is the future? "A captivating and complicated coming-of-age tale for fans of surprising heroines." you can’t help rooting for Shelby. Anyone looking for a lighthearted read will love this book." who again demonstrates her impressive mastery of the genre." 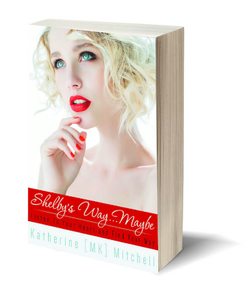 "Once again, Katherine Mitchell has given us a glimpse into the life of Hollywood's rich and famous through the eyes of beautiful Shelby Carpenter. In addition, Katherine has brought life and substance to a fascinating supporting group of characters, anyone of whom could star in his or her own book." and former Book Club president for six years.